(CAMBRIDGE, MASS)–I got back from a vacation just in time for the pipe bombs and attempted assassination attempts on two former presidents, among other prominent outspoken people, and a major media organization. It’s the reason I took a vacation in the first place–to get away from the nasty hot rhetoric that only seems to serve the cynical administration in its quest to ruin our democracy. Bryce was the perfect perspective provider. 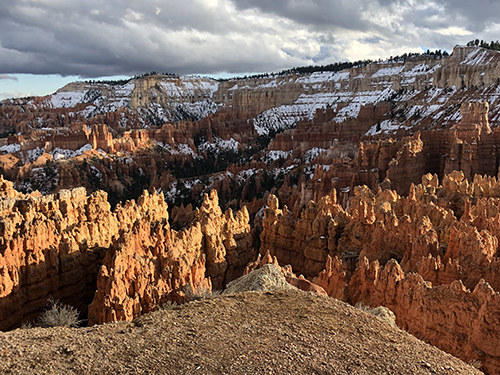 It’s home of the hoodoos, shaped over millions of years by erosion, water, and violent earth movement, leaving these magical geological forms. Could be human. Or animal. Or god. Though Trump upon first sight might claim to see himself. 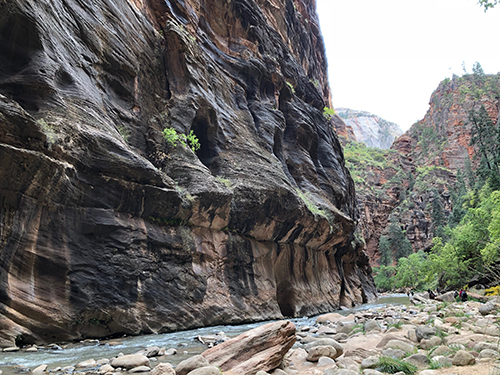 At Zion National Park, I walked the Narrows. Nothing like walking on water between massive sandstone rock to feel a perfect sense of humility and smallness. There’s also a kind of Lao-Tzu, Bruce Lee thing going on. The Narrows were shaped by the Virgin River, which, compared to the Mississippi, is practically a trickle. The power of water, right? It’s also the kind of thing that reminds you of the things that last, and the things that don’t. So I gladly missed Trump’s nationalistic rants; his indecisiveness and lack of resolve on the murder of journalist Jamal Khashoggi, the hyping of the caravan folk; the immigrant scapegoating; and the scourge of the public charge. So it’s good that Asian Americans are revved up for the midterms, with voter enthusiasm higher than in 2014. That’s one of the findings from the 2018 Asian American Voter Survey released earlier this month. The Asian American electorate has doubled, adding three million new voters in 16 years. The AAVS shows a high degree of dissatisfaction with Trump, 58 percent to 36 percent. The only ethnic groups to diverge are the Vietnamese, giving Trump a 64 percent approval, and the Filipinos, with a 48 percent approval. Maybe it’s the Trump love of Duterte that has garnered a following among Filipinos. We’ll get more into the coming election next week. But it’s shaping up to be the most important midterms in our lifetime, especially if you are concerned with equity and justice for people of color and women. With all the noise, it’s interesting to see that a hot-button race issue like the Harvard affirmative action trial has not been totally overshadowed. I’ve written about the political contours of the case previously. But what most don’t understand is how the majority of Asian Americans, 58 percent, see affirmative action as a good thing. And when asked if they favor or oppose affirmative action programs designed to help blacks, women, and other minorities get better access to higher education, 66 percent of all Asian Americans are in favor. Even the Chinese American voters were 64 percent in favor. So what is the Harvard case about? It’s really the last stand of the professional anti-affirmative action crowd, which once thought they had something going with California’s Proposition 209. By referendum, affirmative action was banned in that state and the group sought to nationalize the idea. But it’s run into some bumps along the way. After losing Fisher v. U. of Texas in the Supreme Court, conservative advocate Ed Blum turned to the use of Asians as victims, formed Students for Fair Admissions, and made affirmative action a semi-hot issue again. But in the time since Prop 209 in the 1990s, the racial demographics have changed so much that it’s the whites who are more concerned about their dwindling part of the pie. Blum’s group purportedly represents Asian applicants in the Harvard case, but if the federal court decides to ban race-conscious admissions, the real beneficiaries will be whites. That’s why you won’t see many Chinese American plaintiffs taking the stand to tell their story. So far in the first weeks of the trial, it’s all about stats and numbers. But is there intentional discrimination against Asians, when race is just one factor in the admissions process? No matter what stats you use, the bottom line is that Asian Americans have been anywhere from 16 to 23 percent of Harvard’s freshman class in recent years. In other words, they’ve been well represented. It would be great to hear from the Chinese American students who feel they were discriminated against. But so far, reports say none will be testifying. That’s why in the last week of the trial, the big guns for Harvard may be its students. The ones who got in, who didn’t have perfect scores and highest grades. Sally Chen is one of them. 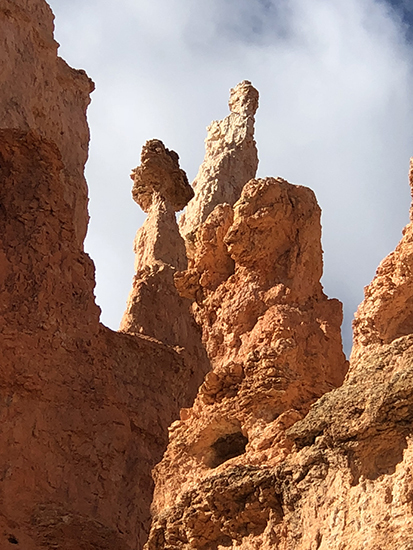 While I was with the hoodoos, I sneaked in a call to her and asked what she’d do if she hadn’t gotten into Harvard. “I would have gone to another university, like UC Berkeley, where I could have been just as happy,” she told me. Now that’s an attitude the rejected Asian applicants, represented by Students for Fair Admissions, should have. Don’t buy the line from some Asian American groups that say this is about your kids and future Asian American kids. That’s what Ed Blum wants you to think, while he uses Asians as white proxies in his life mission to end affirmative action. I will have more with Sally Chen next week, when she talks about race-conscious admissions and the Harvard case. In the meantime, I am heading to Cambridge this week for the Harvard Asian Alumni Alliance conference this coming weekend. As I’m fond of saying, it’s the organization that put the HAAA in Haaa-vahd. I will do a six-minute bit at the story slam, and if you are in the area and want to cheer me on, email me at emilamok[at]gmail.com by Friday at 6 pm (EST)–I have a limited number of free tickets. It’s likely to be a “veritasian” event.